Received: August 20, 2018; Revised: August 24, 2018; Accepted: August 24, 2018; Published online: December 31, 2018. Continuous ambulatory peritoneal dialysis (CAPD) is a good treatment option in young patients with end-stage renal disease. Peritoneal-pleural leakage is an uncommon complication in patients undergoing peritoneal dialysis. This complication is not life-threatening, but the exact pathophysiological mechanism and proper management remain to be elucidated. A 29-year-old woman visited our hospital due to exertional dyspnea. The symptoms had become aggravated over a few weeks. She had initiated CAPD 4 weeks prior, and the result of her peritoneal equilibration test showed high-average transporter status. Her vital signs were stable, and her laboratory data including electrolytes were normal. 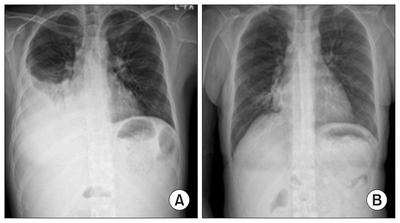 However, chest radiography revealed right-sided massive pleural effusion. Consequently, we performed diagnostic thoracentesis. The gross color of the pleural fluid was slightly yellowish. The results of the fluid analysis showed transudate, and the glucose level of the pleural fluid was higher than that of the plasma. To confirm peritoneal-pleural leak, peritoneal scintigraphy using Tc-99m diethylenetriamine pentaacetic acid was performed. Diffuse increased uptake in the right hemithorax was observed 24 hours after isotope administration (Fig. 1). Her internal jugular catheter for hemodialysis had been recently removed. Thus, we could not interrupt peritoneal dialysis to manage the peritoneal-pleural leak. We changed to automated peritoneal dialysis using small dwell volumes at night. Her symptoms and signs resolved within only 2 weeks of nocturnal intermittent peritoneal dialysis (Fig. 2). Intermittent or full rest of the peritoneal membrane may be a good option for management of peritoneal-pleural leaks. Fig. 1. Diffuse increased uptake of radioisotopes in the right hemithorax was observed 24 hours after radioisotope administration. Fig. 2. (A) A massive pleural effusion is shown on the right costophrenic angle. (B) After switching peritoneal dialysis modality, the pleural effusion was resolved.